The fundraising event will be at the, Auto Club Speedway in Fontana CA on Saturday, August 3 and Sunday, August 4, 2019. Volunteers must be 21 years old ( bring your ID) or older as we will be selling drinks. Volunteers are needed from 10 am until 12 midnight., on each day. We need 5 volunteers for this event. I.C.A.R.E. (Into Ca n in e Adoption Rehabilitation and Education) Dog Rescue, is located in Rancho Santa Margarita CA. We are a nonprofit 501 (c) (3) tax exempt organization. We are a foster based rescue that encompasses foster homes in Orange, Riverside, Los Angeles, San Bernardino and Kern Counties. I.C.A.R.E. is 100% volunteer operation with over 200 volunteers working toward our goals. We have no paid staff and are funded solely by monetary and in-kind donations from our supporters. We were founded in 2010 with a hope and a dream. A handful of dedicated animal lovers came together to combine their resources, time and energy to rescue dogs that had been abandoned, abused or were dumped and no longer part of a family. In the ensuing years, over 2000 dogs have been saved, received full medical treatment (including spay/neuter/micro- chipped.) to ensure a healthy life. Adopters were then screened, and home checked to confirm a safe and loving environment. 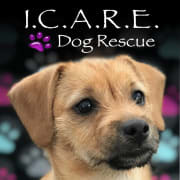 We believe that once an ICARE dog, always an ICARE dog, this guarantees that any dog is welcomed back if circumstances change with the adopter.